You can catch the podcast of September 10’s NM Film Works radio broadcast; I come in at the 21-minute mark with host Trish Lopez to discuss screenwriting, Mastering Celtx , and an exciting new event we’re launching in the Moving Image Arts department at Santa Fe University of Art and Design. I’ll be back on local radio in Northern New Mexico this weekend, discussing Mastering Celtx , along with a new annual event we’re launching at Santa Fe University of Art and Design. Albuquerque and surroundings: Sunday, September 11 at 12noon on 1350-AM. Sadly, there is no live online streaming, but the show will be archived online early next week, and I’ll post the location for online playback then. Santa Fe University of Art and Design has been kind enough to spotlight my new book in a press release. 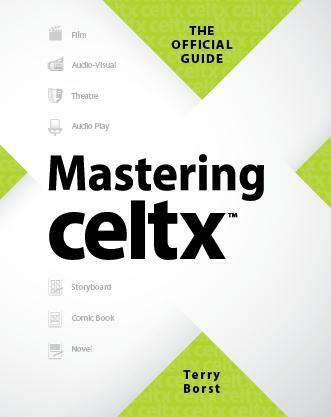 Don’t forget that you can find out all about Mastering Celtx on the book’s dedicated blog — where you can find easy links to purchasing the book on Amazon or Barnes & Noble. The Mastering Celtx blog now joins the Twitter feed. The blog is also published on my Amazon author page, and it’ll explore screenwriting and pre-production issues and how Celtx can typically offer solutions. The blog will also convey news about the book, instructional resources, and occasional speaking appearances and radio interviews I undertake. Check it out if you’ve got an interest in screenwriting or producing media; comments can be left and if you decide to share a post via Facebook, Twitter, or other social media, I’ll be flattered indeed.